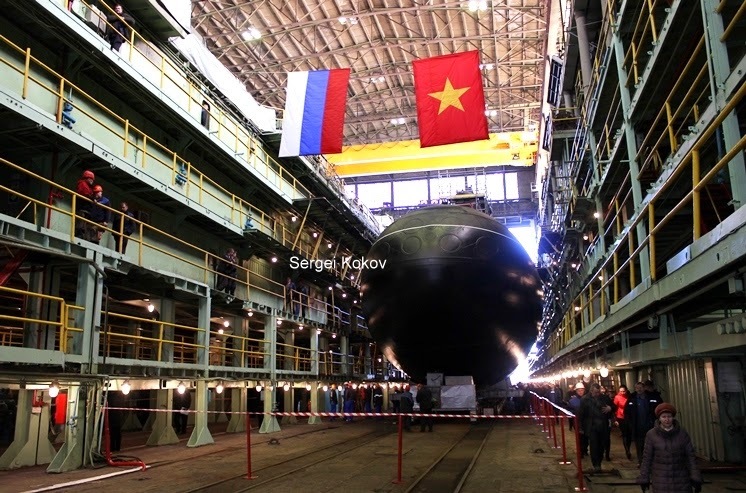 March 28, 2014, at shipyard Admiralty Verfi in St. Petersburg, the official ceremony of launching submarine Project 636.1 HQ-185 "Khanh Hoa" (Khánh Hòa) for Vietnam Navy. Close up HQ-185 Khanh Hoa submarine in ceremony launch 28 March. The ceremony in the presence of representatives of Vietnam Navy, the St. Petersburg Administration, Rosoboronexport and OAO CKB Rubin. HQ-185 Khanh Hoa is the fourth serial submarine in total six submarine build for Vietnam Navy follow a contract singed 2009. The first three submarines, includ HQ-182 Hà Nội, HQ-183 TP. Hồ Chí Minh (has been transferred for Vietnam Navy), HQ-184 Hải Phòng testing on the sea. Vietnam ordered a fleet of six Russian-made submarines in 2009 in a step seen as an effort to counterbalance China’s expanding maritime influence in the region. The contract, which also stipulates the training of Vietnamese submarine crews in Russia, is reportedly worth $2 billion. The submarines are being built at the Admiralteiskie Verfi shipyard in St. Petersburg. All six boats are due for delivery by 2016. The Project 636 class boats displace 3,100 tons, reach speeds of 20 knots, can dive to 300 meters and carry crews of 52 people. The submarines, which feature 533-milimeter torpedo tubes and are armed with torpedos, mines, and Kalibr 3M54 (NATO SS-N-27 Sizzler) cruise missiles, are mainly intended for anti-shipping and anti-submarine missions in relatively shallow waters.